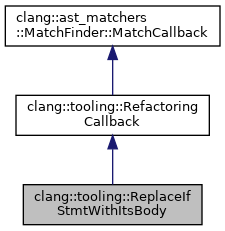 Replace an if-statement bound to Id with the outdented text of its body, choosing the consequent or the alternative based on whether PickTrueBranch is true. Definition at line 126 of file RefactoringCallbacks.h. Definition at line 122 of file RefactoringCallbacks.cpp. Definition at line 126 of file RefactoringCallbacks.cpp. 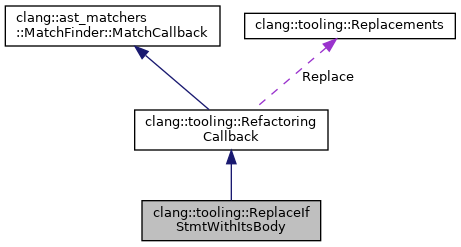 References clang::tooling::Replacements::add(), clang::ast_matchers::BoundNodes::getNodeAs(), clang::tooling::Node, clang::ast_matchers::MatchFinder::MatchResult::Nodes, clang::tooling::RefactoringCallback::Replace, clang::tooling::replaceStmtWithStmt(), clang::tooling::replaceStmtWithText(), clang::ast_matchers::MatchFinder::MatchResult::SourceManager, and toString().